San Francisco is my favorite US City, in part because it asks the right question. I have to confess that one of my favorite things is going to an action where i really believe in the message or demand, but am not involved in organizing the action. It is the perfect working holiday for me. Tomorrow at 10AM i will get this with the Code Pink crowd at Senator Dianne Feinstein’s house. “Who do you want as the director of the CIA, Mary Poppins?” i replied to Modok, who had just commented that Brennan was a psychopath. And Brennan is terrible. He endorsed torture and rendition. He lied about the drone program having no civilian casualties. And he is the author of the current drone policy which is the center of the controversy around his confirmation, in the eyes of code pink and others who watch this stuff carefully. The Obama administration, which ran on a transparency campaign, is hiding the drone policy information which Brennan wrote. So Feinstein, who runs the Senate Intelligence sub-committee and who has the highest security clearance, is unable to see why we kill Americans and Pakistani children with flying robots. We are going to go to her house to demand that she grow some ovaries and demand these documents. Here is the Action alert, swing by if you are in the city and say hi. Code Pink is in action AT DIANE FEINSTEIN’S house tomorrow to demand that she not go ahead with confirmation of John Brennan as CIA Director until she obtains the DOJ drone memos that reveal his involvement with U.S. drone murder policy. We are telling her that, as her constituents, we are WATCHING her and demanding that she insist on getting the memos or NO CONFIRMATION. We believe that Feinstein is in the Bay Area, and that she will know we’re out there. We’ll have banners, signs, drums, flutes, good energy, videographers and photographers, and hopefully the news media. Could everyone please forward this action information asap to occupy, peace and justice, and other groups you have contacts for? Thank you so much. Where: Diane Feinstein’s mansion, Pacific Heights, 2460 Lyon @ Vallejo St.
What: Stand with Code Pink to demand– No Drone Memos, No Brennan Confirmation! We’re also asking Feinstein to hold hearings on the U.S. drone program, and to stop the killing by drone of civilians, both U.S. and all others. 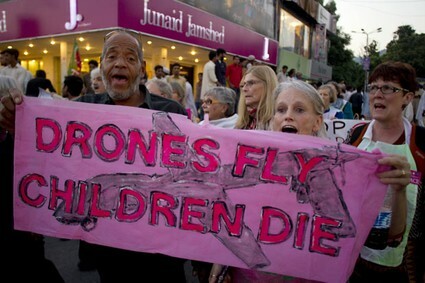 No one should have to live in fear of death from U.S. drones in the skies above. We want the wars, all illegal, to end too of course. Come out and demand that your senator listen to her constituents and stop the bleeding and injustice NOW.